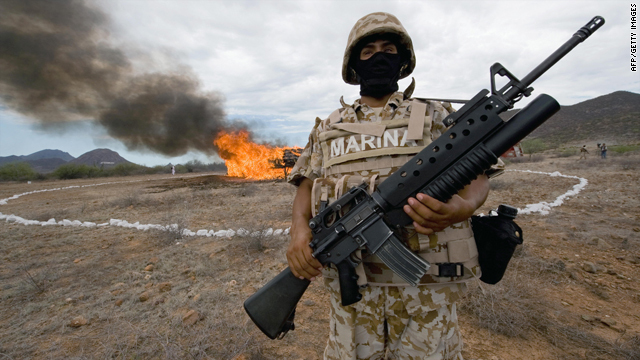 A Mexican marine stands guard as 7,000 kilograms of seized marijuana are incinerated on July 9, 2009, at the naval base in Guaymas, Sonora state, Mexico. (CNN) -- The United States and Mexico should both legalize marijuana in an attempt to break the power of the Mexican drug cartels and end the spiraling violence south of the border, a former Mexican foreign minister said Tuesday. Jorge Castaneda, in an interview with CNN's Christiane Amanpour, said marijuana "should be legalized in both countries," and said it is ridiculous for Mexico to try to stop marijuana from entering the United States when it's legally sold for medical purposes in California. "The Drug Enforcement Administration says that 60 percent of the Mexican (drug) cartels' profits come from marijuana. If we start with that, it's a big chunk," he added. "We can't do everything overnight ... and we can't do it in Mexico if the U.S. doesn't do it at the same time." Castaneda strongly criticized Mexican President Felipe Calderon for declaring war against the drug cartels, a war that has cost as many as 17,000 lives since he took office in December 2006. In the past month alone, 900 people were killed -- a new monthly record, he said. Sixteen students died in what's thought to be a drug-related massacre in the border city of Juarez over the weekend. "It's hard for me quite honestly -- and I think for many Mexicans -- to accept that the more deaths we have, the more successful the strategy is," he added. "I think President Calderon rushed into this, and now we're paying the consequences." Mexico's consul general in New York, Ruben Beltran, who also served in the U.S. border states of California and Arizona, strongly disagreed with Castaneda's assessment. "Are we going to raise the white flag? Are we going to surrender? Are we going to surrender the ability of the government to look for the rule of law and secure the rule of law?" he asked. "I don't think there's an alternative," he said. "The monopoly of force -- use of force -- pertains to the state, and the state is the one who should use the force to secure the stability of the country." Calderon has sent 45,000 troops to help overstretched police departments fight the drug cartels. "What we're witnessing right now is maybe the peak of that violence," Beltran said. "Let me assure you that the Mexican government is not going to relinquish its duty to confront organized crime, and that's what's happening right now." Castaneda, however, said Mexico is paying an enormously high price because of the aggressive approach of the Calderon government. He said the administration should be seeking to contain drug cartels, not destroy them. "It's not different from what 100,000 American troops are doing in Afghanistan with heroin. Not one of those troops is combating the heroin traffic from Afghanistan. They're containing it because they have other priorities," he said. Beltran conceded it's going to take more than one administration in Mexico City to defeat the drug cartels. He also called on the United States to provide more help: "In order for Mexico to be successful in this war, we need increased cooperation with the United States to stem the flow of cash, weapons, and ammo from the United States to Mexico." Castaneda, however, said that on a recent trip across the border from San Diego, California, to Tijuana, in the Mexican state of Baja California, there was not the slightest inspection of any car crossing from north to south, on either the U.S. or Mexican side of the border. "They can't do it. It's too expensive," he said. "The local communities don't want it. It backs up queues tens of miles north, the same way as in the south. They're not going to do it." Castaneda's observation puts in question a promise by U.S. Homeland Security Secretary Janet Napolitano in March last year, when she said, "We're sending technology to the border that will allow us to scan or do non-invasive X-rays to see whether cars are carrying assault weapons, other kinds of weapons, that are flowing into Mexico to fuel these drug cartels."